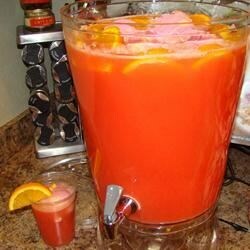 "This is punch is so extremely easy to make that a child could do it, yet it is so delicious. It is always served at our family gatherings, and my sisters, brother and I all had it served at our weddings." A little bit tart...did not just "love" this recipe. Probably won't make again. I made this for a baby shower and it was a big hit. I had shaped blocks of frozen orange juice and fruit punch floating in it to keep it cold and it was so colorful. I made this punch for an event at church and both adults & children liked it. This punch was great. I made it for a bridal shower. Only 12 people came to the shower, but there was not a drop of punch left. Great and easy. I host a lot of receptions as part of my job. I make this punch every time because it's fast and economical. It's always a hit! Very good and really easy. I made this for my son's first birthday party and everyone loved it. How refreshing!! I served this at an informal get together at my home and received nothing but raves and requests for the recipe. Thanks for sharing, Amy.